BEIRUT — Lebanon’s U.S.-backed military is gearing up for a long-awaited assault to dislodge hundreds of Islamic State militants from a remote corner near Syrian border, seeking to end a years-long threat posed to neighboring towns and villages by the extremists. The campaign will involve cooperation with the militant group Hezbollah and the Syrian army on the other side of the border — although Lebanese authorities insist they are not coordinating with Syrian President Bashar Assad’s government. But the assault could prove costly for the under-equipped military and risk activating ISIS sleeper cells in the country. The tiny Mediterranean nation has been spared the wars and chaos that engulfed several countries in the region since the so-called Arab Spring uprisings erupted in 2011. But it has not been able to evade threats to its security, including sectarian infighting and random car bombings, particularly in 2014, when militants linked to al-Qaida and ISIS overran the border region, kidnapping Lebanese soldiers. Aided directly by the United States and Britain, the army has accumulated steady successes against the militants in the past year, slowly clawing back territory, including strategic hills retaken in the past week. Authorities say it’s time for an all-out assault. In a clear distribution of roles, the army is now expected to launch the attack on ISIS. In the past few days, the army’s artillery shells and multiple rocket launchers have been pounding the mountainous areas on the Lebanon-Syria border where ISIS held positions, in preparation for the offensive. Drones could be heard around the clock and residents of the eastern Bekaa Valley reported seeing army reinforcements arriving daily in the northeastern district of Hermel to join the battle. 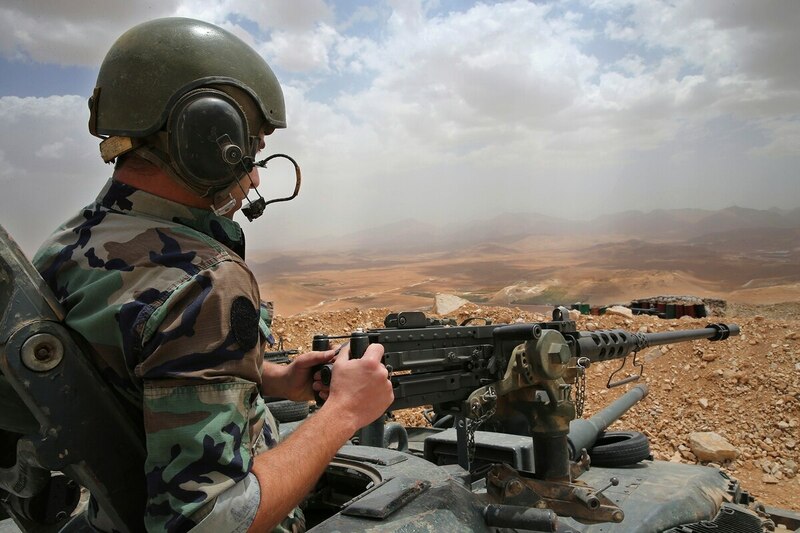 The offensive from the Lebanese side of the border will be carried out by the Lebanese army, while Syrian troops and Hezbollah fighters will be working to clear the Syrian side of ISIS militants. Hezbollah has been fighting alongside Assad’s forces since 2013. On Tuesday, the army’s top brass conferred with President Michel Aoun, Prime Minister Saad Hariri and interior and defense ministers at the Presidential Palace to plan operations in the eastern Bekaa Valley. The committee took the “necessary counsel and decisions to succeed in the military operations to eliminate the terrorists,” Maj. Gen. Saadallah Hamad said after the meeting. According to Lebanon’s Interior Minister Nouhad Machnouk, there are about 400 ISIS fighters in the Lebanese area, and hundreds more on the Syrian side of the border. U.S.-backed Kurdish militants released footage of its forces striking Turkish-backed rebels with heavy weapons in northern Syria. A Lebanese security official said authorities are taking strict security measures to prevent any attack deep inside Lebanon by sleeper cells. The official, who spoke on condition of anonymity in line with regulations, said authorities have detained several ISIS militants over the past weeks. Lebanese politicians say ISIS controls an area of about 296 square kilometers (114 square miles) between the two countries, of which 141 square kilometers (54.5 square miles) are in Lebanon. The area stretches from the badlands of the Lebanese town of Arsal and Christian villages of Ras Baalbek and Qaa, to the outskirts of Syria’s Qalamoun region and parts of the western Syrian town of Qusair that Hezbollah captured in 2013. The U.S. is supplying armored tractors and bulldozers to Kurdish militants to mitigate the IED threat as they fight to liberate Raqqa, Syria, the Islamic State's de facto capital. “Opening two fronts at the same time will speed up victory and reduce losses,” Nasrallah said, adding that his fighters on the Lebanese side of the border are at the disposal of Lebanese troops if needed. “I tell Daesh that the Lebanese and Syrians will attack you from all sides and you will not be able to resist and will be defeated,” he said, using an Arabic acronym for the extremist group. “If you decide to fight, you will end up either a prisoner or dead,” Nasrallah added. Some Lebanese politicians have been opposed to security coordination with the Syrian army. The Lebanese are sharply divided over Syria’s civil war that has spilled to the tiny country of 4.5 million people. Lebanon is hosting some 1.2 million Syrian refugees. Last week, Hariri told reporters that Lebanese authorities are ready to negotiate to discover the fate of nine Lebanese soldiers who were captured during the raid on Arsal by ISIS and al-Qaida fighters in August 2014. Unlike their rivals in al-Qaida, the Islamic State group is not known to negotiate prisoner exchanges. “The presence of Daesh will end in Lebanon,” Hariri said, using the same Arabic acronym to refer to ISIS.